"Super easy to make and tastes great. No need for a candy thermometer!" Spray a baking sheet and a wooden spoon with cooking spray. Mix sugar and corn syrup together in a microwaveable bowl safe for high temperatures. Heat sugar mixture in microwave on high for 5 minutes. Stir peanuts and butter into sugar mixture. Heat in microwave until mixture becomes a caramel color, 3 to 4 minutes. Mix baking soda and vanilla extract into syrup until smooth and foam has dissipated. Spread candy onto the prepared baking sheet using the sprayed wooden spoon. Work quickly; candy hardens fast. Let stand until cool. Break into pieces to serve. 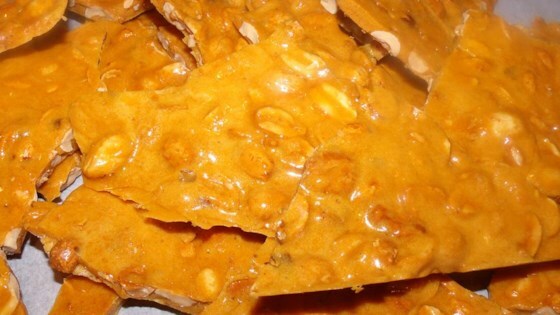 I love peanut brittle and found this recipe to be a wonderful way to make it fast and very easily. This was easy, tasty and beautiful to look at. Excellent! Try using honey roasted peanuts for a great variety of taste. So easy to make and delicious! Yummy yum yum!!! A huge hit! Only tip is to pre measure everything so you can work quickly. Fast is the key word.